The Scottish government has announced plans to scrap the graduate endowment fee paid by students after graduation. What is a graduate endowment? The graduate endowment fee is a fixed amount that most graduates have to pay at the end of their degree. It is covered by the Education (Graduate Endowment and Student Support) (Scotland) Act 2001. How much do the graduates have to pay? The amount to be paid is fixed at the time a student begins his or her degree course. Students who began their course in the 2006/2007 academic session will be due to pay £2,289 on graduation. The fees were introduced in 2001. The first students started paying in 2005. The income from endowment fees goes into bursaries for students from 'non-traditional' backgrounds and to help support future generations of students. This was a political decision about student support and it is expected that the Scottish Executive will announce that they will scrap the fees and meet the cost of these extra bursaries themselves. Who has to pay the endowment? The fee applies to Scottish domiciled students and EU students who started their first full-time degree course at a Scottish institution on or after 1 August 2001. Students are eligible to pay if they receive a degree or if they meet the requirements for an award. Also eligible are students who returned to higher education in 2001-2002 or later, after a break in study of at least one academic year. When did the graduates have to pay the fee? Graduates are expected to pay the endowment in the April after they complete their course. Were any students exempt from endowment fees? Several categories of students are exempt from paying, including 'mature' students and part-time students, as well as those studying exempt courses such as midwifery and nursing. Do Scottish students pay tuition fees? 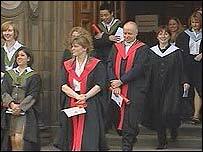 Tuition fees were abolished for eligible Scottish domiciled and EU students studying full-time higher education courses in Scotland in 2001. However, critics have described graduate endowment fees as "tuition fees by the back door". Students from outside Scotland, but studying there, pay £1,700 a year in tuition fees, or £2,700 for those studying medicine. Opponents have claimed Scottish universities will face a competitive disadvantage as compared to English institutions, due to the additional revenue derived from top-up tuition fees south of the border. Do Scottish students get grants? No. The SNP earlier pledged a return to "free university education", as part of a £100m package for students which included abolishing student loans and a return to the grant system. Opponents have reservations over what those policies would actually cost. These are managed by the Student Loans Company (SLC). Students can apply to add the cost of their endowment fees to their existing student loan. Do the graduate endowments affect other UK students in Scotland? Will scrapping endowment fees change how Scottish universities get their revenue? The endowment was not intended to fund universities. The Scottish higher education industry had a total revenue of £1.9bn in 2004/20005. The sector receives 51% of its funding from public sources, and 14% of revenue was derived from other public sector bodies for other purposes, including for research contracts, consultancy and other services. A further 35% of the higher education sector's revenue was earned from the private sector and international clients. Should the graduate endowment be scrapped?